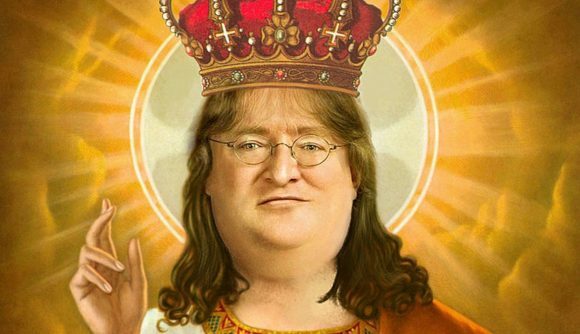 March 19, 2019 An email from Gabe Newell implying that another Half-Life would release in five years was fake. Valve has now confirmed to us that the email is “not ours”. The man behind VNN has pulled the video after two separate sources also confirmed to him that the email was fake. VNN has a regular series featuring authentic fan correspondence with Valve and has often spoken with Gabe directly in the past, so this is a rare lapse. The email was dated November 8, which was just a few days before the last semi-substantial Half-Life story emerged. Images of a Valve-built VR headset had leaked onto the internet, which Upload VR then claimed to have verified via its own internal sources. Upload VR went further, to say that Valve would bundle its headset with its Knuckle VR controller and a Half-Life prequel. The idea of a fully-fledged Half-Life 3 is, infamously, the rumour that never dies, and one of the last times it clawed its way from the grave was when Valve’s interest in VR became clear and everyone decided a new Half-Life would be its system seller, much like Half-Life 2 was for Steam. Valve then partnered with HTC to manufacture the Vive and no Half-Life game arrived. With the quashing of this latest rumour, Valve’s official position seems unchanged since then.